LOUIS GLASS (1864-1936): Complete Symphonies, Vol. 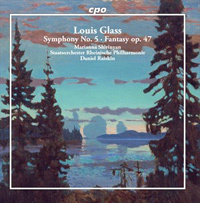 2 - Symphony No. 5 in C, Op. 57 “Svastika”, Fantasy for Piano and Orchestra, Op. 47. Description: The 25-minute Fantasy dates from around 1912 when Glass was very involved with Theosophy and was plainly trying to translate some of its precepts into music. The score comes with a motto: “From the spirit’s eternal canopy tones calling man sound down. And man turns away from the world and remains alone in order to find peace.” A hymn-like motif anchors the work, the piano often embroidering rather than acting as heroic soloist and, while two animated passages occur, this is music dominated by an inwardness, meditativeness and a calm, dignified beauty. It’s been almost 25 years since the Marco Polo recording of this 1919-20 symphony appeared and its barely-there notes said nothing about its own theosophic connections. Predominantly lyrical and pastoral, its four movements, “Daily Toil”, “Rest”, “Shades” and “Dawn” are a sort of human microcosm of the “Wheel of the Sun” whose syymbol was the Sanskrit noun svastika (“cross”). Marianna Shirinyan (piano), Staatsorchester Rheinische Philharmonie; Daniel Raiskin.